We offer a wide range of services to ensure that your vehicle’s engine runs as good as the day it left the factory. From comprehensive engine diagnostics and fault analysis to full engine re-builds, we have decades of experience that will ensure that your engine runs smoothly mile after mile. 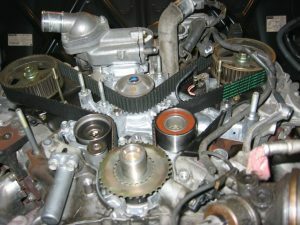 We also replace cambelts and timing chains, and we can also repair engines that have been damaged following cambelt failure. We also advise when head gaskets need replacing and we offer a full repair or replacement service, for radiators and alternators. Wherever possible we will specify original manufacturers parts, to ensure that warranties are not affected, but where warranties are not an issue we will generally recommend non-orignial parts, which are significantly less expensive and are just as reliable. For all repairs relating to engines and associated parts, we will always give a clear indication of the total cost before you agree to proceed. If you have any warning lights on your dashboard that you can’t explain we can quickly identify the problem. 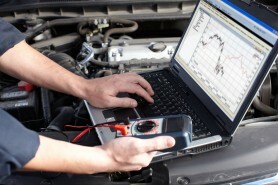 We use state-of-the-art vehicle diagnostic testing equipment and our trained technicians can make sense of any fault codes and advise on any repairs, as necessary. The cambelt is an essential part of your vehicle’s engine and we strongly advise that it is replaced according to the manufacturer’s guidelines. Failure to replace a cambelt can result in catastrophic engine failure, which would require an engine to be rebuilt or totally replaced. At Buxton Car Centre Service & Repairs, we are keen to help you avoid expensive repair bills caused by cambelt failure. Given the importance of the cambelt we recommend that you book an appointment so we can advise on the vehicle’s cambelt replacement interval.